Let's Get Our Grill On With Bobby Flay! I could have saved $40,000 and 6 months, endless cuts and burns, bad hair days, bruised egos, fashion disasters, gas that could peel the paint off the side of a barn, and having cats follow me home because I smelled like a mackerel! As y'all know, I attended the full time 6-month culinary program at the FCI a few years ago (and yes I experienced all of the above... in abundance!) so when I saw this book come out, I had to buy it. Like James Peterson's Sauces, this book too could ballast a boat - all 500 pages! - but it is also a veritable treasure chest, a culinary Fort Knox if you will, of all things cooking. If Techniques is the only cookbook you ever purchase, you'd be set. Techniques is almost verbatim our first quarter (6 week) curriculum. Really! Word for word, gram for gram, ingredient for ingredient. I even pulled out my notebook and compared the Sauces section. Exactly the same. Our first quarter was spent learning these 250 techniques. (Before I went to cooking school I burned water! I still do, just less often...) We then spent the next 3 quarters refining and practicing and expanding on all these techniques. So if you don't want to sacrifice 6 months and $40,000 and the above mentioned humiliations to attend cooking school, then buy this book and cook every recipe over and over and you will become an excellent cook. If you master all the skills and techniques in the book, you can walk into any kitchen (even in France!) and hold your own as this is the foundation of classic cooking and the language of the kitchen. Hints and tips from the Deans and Chef Instructors pepper the book in every technique with tidbits such as "...cook beans at a constant low temperature and cool them in their cooking liquid. ~ Dean Alain Sailhac" or "Do not cover a chicken after roasting or it will steam and make the meat taste reheated." ~Dean Jacques Pepin". It's like getting a personal cooking lesson from some of the world's the greatest chefs. A few that I'm not sure made it into the book that will I will never for include, "If you have time to lean, you have time to clean ~Chef Henri Viain" and "What you put in the pot, you get out of the pot. 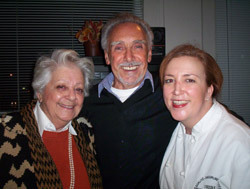 ~Chef Pascal Beric" and God love them both for their dedication to their students. Techniques teaches the 250 classic foundation techniques including stocks, sauces, soups, salads, eggs, potatoes, poultry, beef, veal, lamb, pork, fish, shellfish, marinades, stuffings, organ meats (my least favorite day in cooking school! ), pastry dough, creams & custards, crepes, brioche, frozen desserts, meringues, mousses, and soufflés (my favorite day in cooking school! :) As I browsed through the book, 6 months of my life flashed before my eyes, intermittently cringing while remembering slicing off the tip of my thumb on the mandoline or burning my wrist on the convection oven and laughing out loud picturing the over-whipped genoise, splattered pommes anna, and over salted poulet roti grandmere dubbed "inedible" by the chefs. Many if not all of the recipes in my humble little blog, such as the ones here and here, are based on the foundation I learned in cooking school. 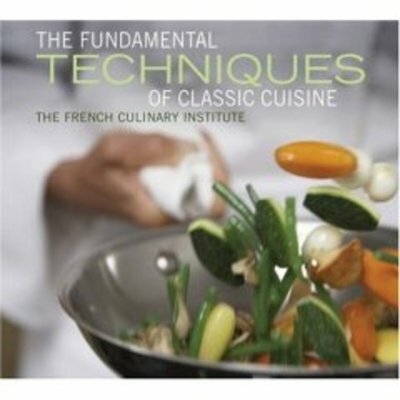 Techniques also explains in great detail terms in a kitchen, names of equipment and pots and pans (and the difference between stainless steel and aluminum, cast iron, non-stick and the benefits and pit falls of each), food safety, knifes and knife skills, and professional kitchen management. If you want to become an great home chef or are considering or about to attend cooking school, I implore you to devour (pun intended) this book. If you learn all the techniques, or at least become familiar with them, then you will be leaps and bounds ahead of the game. Bon courage et bon appetit! The mere whisper of the word Provence awakens images of flowing lavender fields, charming picture-perfect towns and farmers markets overflowing with heads of lettuce still sparkling with the morning dew and fresh milk and cream ladled from tall metal canisters, all being sold by the quintessential French farmer. 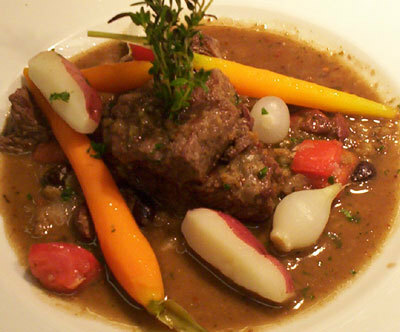 You will see the similarities in other distinctive Provencal dishes including ratatouille (eggplant) and soup de pistou (with fresh basil and pine nuts) ,daube (stew) and probably the most often associated with the south of France, bouillabaisse (fish soup with garlic, olive oil and saffron). The delights don't stop there. The region is home to some world famous wines with ties all the way up to the sky. Opulent red wines include Cotes du Rhone and the noble Chateauneuf-du-Pape (new castle of the pope!). Crisp white and rose wines include Coteaux des Baux-en-Provence and Coteaux d'Aix-en-Provence and don't forget the apres-meal with a Beaumes-de-Venise Muscat, an unctuous amber dessert wine. I learned this dish in cooking school. In our last quarter, we cooked for the restaurant within the school, aptly named l'Ecole (the school). This is so popular and such a traditional French dish, it is still on the menu! Step 1. Prepare your mise en place which means everything in its place (literally 'put in place'). Set out all the equipment you will need (pots and pans, spoons, etc) and all the ingredients. This way, you won't get half way through a recipe and realize you are missing a key ingredient and guaranteed, all the stores will be closed. I always keep a small bowl or plastic bag next to me for garbage such as carrot peelings, vegetable ends, garlic skins, etc. 1. For these tiny red potatoes, the recipe calls for peeling only half way around so you can still see the beautiful red skin contrasted against the white flesh. 2. Trim and peel the baby carrots and pearl onions. 3. Cook the onions and carrots separately in boiling salted water. Shock (drop in ice water when done to stop the cooking), drain and set aside in a bowl. Save the cooking liquid. 4. Cook the potatoes in boiling salted water but do not shock. Set out on a plate on a piece of paper towel. Save the cooking liquid. 5. While the veggies are cooking, peel and cut the large onion into a fine dice. 6. 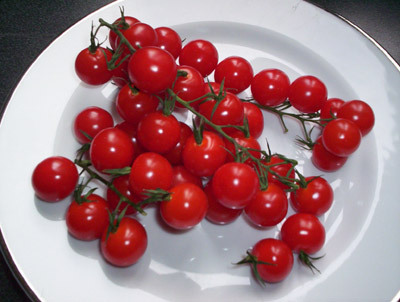 Depending on the size of tomatoes, cut lengthwise into 6 or 8 sections from top to bottom. Cut out seeds and then set the slice of tomato skin side down and cut through as close to the skin as you can. Then cut the slice into triangles, approx 3 per slice, or what ever shape you want. 7. Brown the beef cubes in a pot in a little olive oil. Remove meat, set in a bowl. 8. Saute onions in the same pot. Add a little olive oil if the pan is dry. Move cooked onions to the bowl with the meat. 9. Deglaze the pot with the wine. 10. Add the meat and onions back to the pot. Add the herbs to the pot. 11. Add the cooking liquid from the vegetables to cover the meat. Do not salt. 12. Cover the pot with foil or a lid. Cook for 1 to 1-1/2 hours on the stove so that the liquid is at a low simmer. 14. Chop the garlic to a paste. 16. Put the toasted bread, hazelnuts, garlic and parley in a food processor and pulse until finely chopped. 17. Just as the meat is finishing up cooking, add the carrots, pearl onions, potatoes and Arlesienne mixture to the pot. Stir to combine and thoroughly warm the vegetables. The Arlesienne mixture will thicken the broth. 18. At the last minute, add the capers, olives and tomato triangles. Stir to combine and taste for seasoning. Add sea salt and fresh ground pepper to your taste. 19. Plate in a bowl and garnish with chopped rosemary, thyme and rosemary sprigs. Now most Provencal recipes beckon for a light, crisp white or rose but for this dish, and the fact that it is still winter with near arctic temperatures, I'd prefer a stronger wine from the north of Provence, one with papal ties preferably so for this I would serve a Chateauneuf-du-Pape, specifically one from Domaine du Banneret. I had the pleasure of tasting this glorious Rhone with a wine expert (not-so-coincidentally the nephew of the winemaker!) on a recent trip to Provence and what a treat! Cheers! Bon appetite d'Arles et Vive la France! IMBB23 ~ Vive la France! Traveling to France and need a place to stay? Then try timeshares for sale. Have all the amenities of home in a time share while enjoying your vacation. Your vacation will pay for itself with timeshare resales. Check out this great book that reviews timeshares in Europe and the hospitality. a huge thanks to Tana for this banner! So voila! For this IMBB23 ~ Vive la France! Or more specifically...Vive la France Régionale avec un Verre du Vin! A fancy way of saying a regional French dish with a glass of wine. Take a traditional French recipe and do a little sleuthing (aka “google it”) to discover a bit more about it, what region it came from and why it was important to that region. For example, take Salad Niçoise. It’s from Nice, hence Niçoise, the Provençal region, but what is it about this salad that earns the Niçoise moniker or what about it is Provençal? 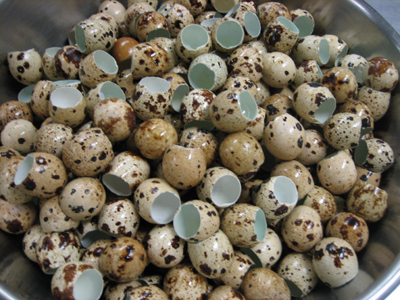 Who invented it and why and why is it considered a traditional dish? There's Beouf Bourguignon or Coq au Vin or Poulet Saute Chasseur or Tarte aux Poires à la Frangipane or Gratinee a l'Oignon or Croque Monsieur et Madame, etc.... Chacun à son goût, as they say here. To each his own taste. Then....since we are in France, you can’t have a meal without a glass of wine, oh mon dieu non!, so pair a wine with your dish. If you’re near San Francisco or on the Peninsula, drop by K&L Wines, the most knowledgeable, friendly wine experts around and if you are in France, well just pop into your nearest Nicolas where they are always delighted to help you select the perfect wine for the meal at hand. If you have any questions about this, give a shout. Please post by Sunday, February 26th and drop me a note when you do. I hope you have some fun at this as the aspect I find most interesting about cooking, especially here in France, is the regionality (is that a word?) of food. Learning where foods and recipes originate and why adds so much more excitement to a meal, like you are consuming a little piece of history along with it... If you are coming up with cookers block, I'm sure you could pick up an idea or two from la reine de la cuisine française herself, Julia Child . Last week I prattled on about consomme and how to make consomme from stock to finish but a few people wrote me asking just how to get from start to stock. Stock (les fonds), also known as boullion or broth, my friends, are nothing less than the foundation of French cooking. Manger! Boire! Vivre! ~ Eat! Drink! Live! The most expensive tomatoes in the world! Maybe Marcella Hazan's Acqua Pazzo ? Hmmmm......where is that recipe? Twice a year Marcella and her husband Victor teach a 1-week class at the French Culinary Institute and I assisted them in their class about a year and a half ago. FCI's Culinary Ampitheatre of a very long week and still smiling! That's another story in itself but one of the items we made was Pesce all'Acqua Pazzo or Fish in Crazy Water, cooking sea bass in cherry tomatoes and white wine. Chef Bruno Quercini at Pane e Vino in San Francisco makes Acqua Pazzo in his Modena-built wood burning brick oven that could move a man to tears, it is so heavenly. It's still too early to call San Francisco so I will have to defer to the grande dame of cucina italiana. Ah, here we go. I brought 4 cookbooks with me to France and hers is one of them. From Marcella Cucina, her recipe calls for snapper but I prefer a thick piece of sea bass. Also, I opt out of serving it on bread, I use about half water and half white wine and when using cherry tomatoes I don't peel them! Finally an Italian recipe :-) This should make my grandmother happy.... Mangia bene! 1. Peel the tomatoes raw and chop them roughly with all their juice and seeds. The yield should be about 2 cups. 2. 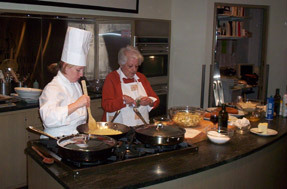 Choose a saute pan in which the fish fillets can be subsequently fit flat without overlapping. Put in the water, garlic, chopped tomatoes, parsley, chili pepper, olive oil, and salt. Cover the pan, turn the heat to medium, for 45 minutes. 3. Uncover the pan, turn up the heat, and boil the liquid until it has been reduced to half its original volume. 4. Add the fish, skin facing up. Cook for 2 minutes, then gently turn it over, using two spatulas. Add a little more salt and cook for another 12 minutes or so. 5. Serve promptly over the optional bread slice. Un énorme merci à Chef Patrick Chazallet et son blog-appétit, www.blog-appetit.com, de me laisser participer quand mon français soit une horreur énorme! C'est une recette que j'ai apprise en l'école de cuisine à l'institut culinaire français mais je l'ai changée un peu et j’ai incorporé des poireaux. Mon livre des recettes est dans une boîte à San Francisco et puisque je suis à Paris, j'ai essayé de le recréer de la mémoire quand je l’ai fait cet weekend ainsi je suis tres désolé pour les mesures moins que spécifiques. 1. coupé dedans à moitié en travers, ensemble d'un plat, couverture avec le film et mis dans le réfrigérateur jusqu'à ce que prêt à faire cuire. 1. emincée la partie blanche et vert clair des poireaux. sauté jusqu'à ce que translucide mais ne le laissiez pas brun mis de côté. 2. coupez les courgettes en petites allumettes, enlevant autant du centre blanc comme possible excepté environ 1/8 inch. sauté jusqu'à ce que cuit mais ne le laissiez pas brun. mis de côté. 3. enlevez les tiges et le sauté jusqu'à ce que fané enlèvent et mettent de côté. 1. Coupez un poivre rouge et orange en brunoises. Sauté sur la basse chaleur en huile végétale jusqu'à ce que juste cuit mais ne laissiez pas le brun de poivres. mettre de côté sur la serviette de papier pour absorber l'huile. 1. Les poireaux, la courgette, et les épinards cuits ensemble dans une casserole de sauté et réchauffent complètement. 2. Placez l'anneau au centre du plat et mettrez de légumes. emballez-le dedans de sorte qu'il garde la forme quand l'anneau est enlevé. 3. 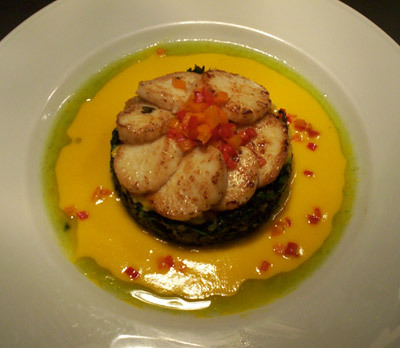 Sauté les coquilles st jacques et la mettrez dans une spirale sur les légumes. 6. Mettrez une cuillère grosse des poivrons brunoises sure les coquilles et en arrosent autour de la sauce.